The HUNTING & SURVIVAL KNIVES Section presents Knives & Folding Knives used by hunters and survivalist all around the world (USA, Canada, United Kingdom, Germany, France, Russia, Italy, NATO, International Military & Security Forces). Each model offers different options and specific capacities for outdoor activities. Use this Knives Section to compare the different Models & Designs available on the market. Choose the best suited knife for your needs in our premium selection. 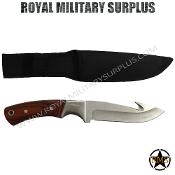 Royal Military Surplus offer a FLAT-RATE SHIPPING POLICY for ALL National/International destinations (We Ship Worldwide). One simple LOW SHIPPING FEE per order (You can buy as much items as you want and your shipping fees will never increase!). FREE SHIPPING AVAILABLE! 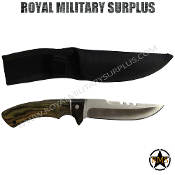 Copyright © 2014-2019 Royal Military Surplus | International Military Surplus Store | Army Navy Tactical Store. All rights reserved.